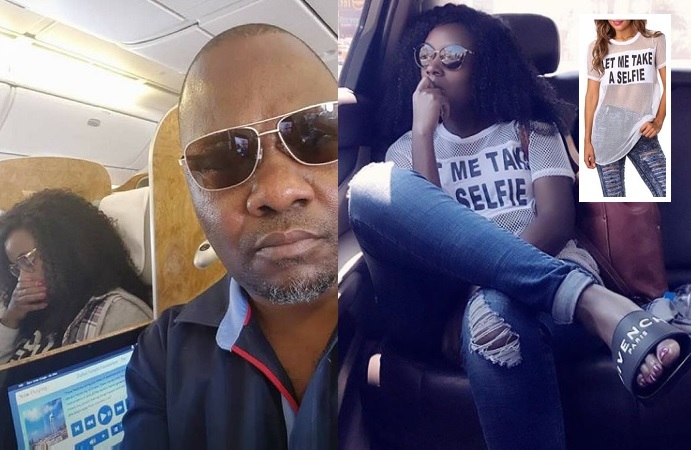 The SELFIE that Desire Luzinda's business partner took while on board has made Juliana to react, she rarely does, but this time she did. For starters who is this person [Lwasa]? What the hell is wrong with some people?, He didn't even greet me or ask to take a pic of me!! Juliana Kanyomozi has disassociated herself from the selfie that was doing rounds online. In the selfie, she is seated next to Lwasa who was quick to grab his smartphone to save the moment. It's evident that the pic was taken when Juliana was asleep and not aware of what was going on at the time, probably thinking of her next hit. "I'm not one to come here and rant or respond to rubbish. But this right here is madness. For starters who is this person? People have been asking me about someone and I was not understanding until someone sent me an article. You can't come and take a picture of someone simply because they happen to be sitting next to you on a plane without their permission, and then go ahead and share it implying that I'm traveling with you. He didn't even have the courtesy to greet me!!!!!! Let alone request to take a picture with or of me. This is intruding on other people's privacy and I could sue you for it!!! What the hell is wrong with some people, abantu tebakyalina mpisa??? " "To my thinking he was just taking a selfie and maybe he couldn't avoid having you appear in the pic since you were the neighbour. Let's always try to give people a benefit of doubt. Many of us have taken such selfies that include our seat mates. Maybe the reporters are the ones to blame. Iam not saying he is Innocent but we shouldn't quickly judge, That's my thought." "But why would he take a selfie without even saying Hi to someone?" "If it is as I think, then there is much more to do with this particular fellow: the so called "selfie" was the last act, but the whole act surely started much earlier - from getting to know Juliana Kanyomozi travel itinerary, the time she booked, and possibly the travel agent that booked her had a hand. The possibility of likelihood of involvement of an insider can't be ruled out at the same time." "You have appeared in so many people's pictures because of the nature of your job. This shouldn't be a burden especially if you so deem it irrelevant." "The man was taking a selfie, and you appeared, and I don't see anything wrong... You travelled on the same plane, what is wrong with that...? And as a celeb, you should be used to these kinds of stories... No need to rant on Facebook." "I disagree this was disrespectful. He knew who he was seated next to. Pictures speak volumes Juliana Kanyomozi was not aware of the pic being taken. If he had been polite enough to ask then the tables would be turned contrary to what is being published. This is just crying out loud for attention. #Respect"
"Nothing wrong at all to travel with someone's partner. If you don't want to travel with people's partners then just hire a private jet and have your peace of mind, but if you're still traveling economy like many of us please bare with ....."
"To all my fans in Masaka, I wish to disassociate myself from the above event, I know nothing about it and certainly I will not appear or perform at that venue as the advert is claiming.."
And now, she is coming out again to issue another disclaimer letting whoever cares to know that she has nothing to do with Lwasa. 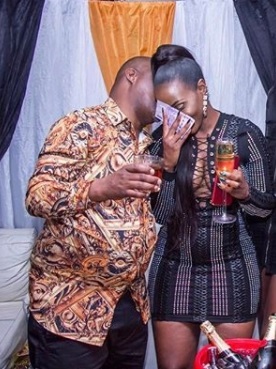 Just last month, Lwasa threw a lavish birthday bash for his business partner, Desire Luzinda, as she celebrated her 25th birthday.